Description: One of the youngest Colonels in the Duke of Wellington’s Army, Ivar Harling returns from the victorious Battle of Waterloo to Harlington House in London’s Berkeley Square. Suddenly a very rich man now that he has inherited the Dukedom of Harlington from his cousin, who has been killed in the War, he is also tall and extremely handsome although his years as a soldier have left their mark on him. And perhaps too in the expression in his eyes, which is perfection to Society beauties such as the glamorous widow, Lady Isobel Dalton, who pursues him avidly and with some success. But although he needs to marry to prevent his scheming and dishonourable cousin, Jason, from stepping into his shoes, he resists Lady Isobel’s desperate hints at marriage as she fancies herself as a Duchess. When a craven pawnbroker, Emmanuel Pinchbeck, approaches him for money to redeem several of his family heirlooms, which it seems that his young cousin, Lady Alvina, has been selling off secretly, he is outraged. 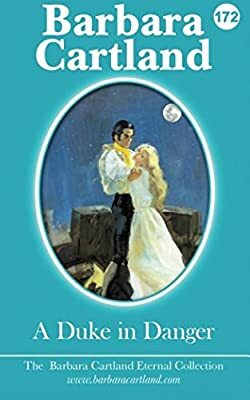 But, arriving at a closed-up Harling Castle in the country, he finds not a devious dishonest woman but a beautiful yet tormented young lady who, unaware of the family’s huge wealth, is in dire financial straits as well as his whole ancestral estate. The Duke is determined to find out how she has been so cruelly misled. And along the way he finds the love that he has always dreamt of finding – but not before the spectre of death steps into his path.